The Akai XE8 is an excellent sounding rackmount midi drum module with a grand total of 16 onboard sounds, slots for 2 extra sound cards each featuring another 16 sounds, 8 individual outputs plus a mix out, some excellent percussion shaping parameters including a pitch envelope, and a baffling operating system thats almost impossible to use without a manual! 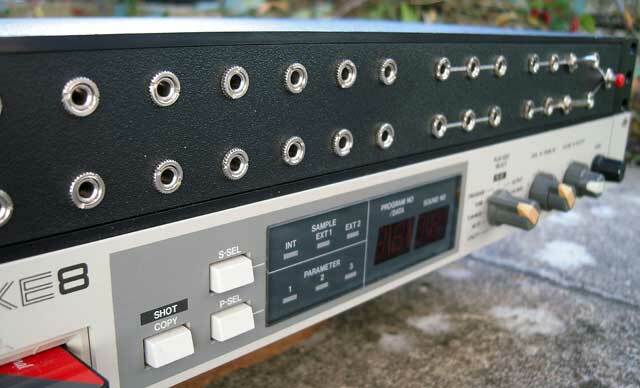 When the XE8 was released in the late 80's nobody else had even thought of a rackmounted digital percussion sound module, and as a result it was way ahead of its time and sank without a trace. This could have had something to do with the fact that like Akai's other drum machine, the XR10, the voices on the XE8 don't sound as dated as they probably should do to have been a success at the time. In fact despite the fact that the samples appear to be recorded at a fairly low bandwidth, they still sound surprisingly fat and usable even today. The patchbay has a total of 22 sockets in the main patching area and also includes 2 X Patchable switches, 2 X 3 way Patching multiples and a patchable momentary pushbutton for quick drum fills and spot effects. These extra features offer huge range of extra percussion grinding possibilities. There is also the addition of a pitch knob that controls all of the onboard sounds simultaneously. This can take the pitch of the sounds way beyond what is possible using the tuning parameters. At its lowest setting the sounds disintegrate into a wall of digital aliasing noise and are barely even recognisable as percussion samples. The only minor drawback of this mod is that at its lowest pitch setting the machine descends into complete chaos and very occasionally gets a bit baffled by what it should be playing, causing some sounds to decay prematurely, become distorted or behave strangely. Due to a the internal construction and a lack of space available on the front panel the pitch knob has had to take the place of the headphones socket. 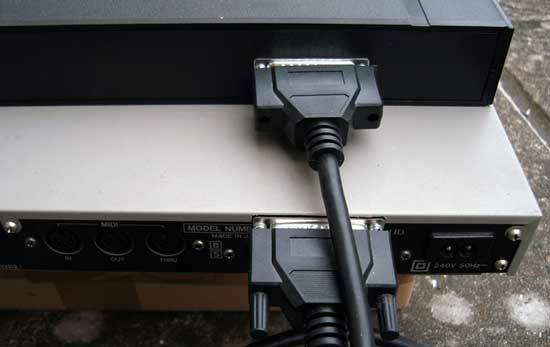 Its not really a great loss though as i don't think we have ever used a headphone socket on a rackmounted unit. Does anyone actually use the headphone socket on sound modules, and if so, for what purpose? Listen to the demos below for some examples of what this machine can do. The demos were recorded using a Yamaha RM1X to trigger the XE8 sounds via midi and were all recorded from the main mix output. 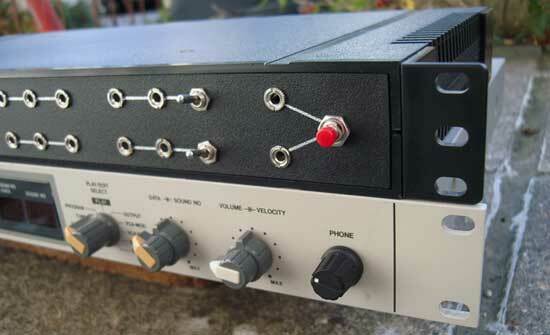 There is no effects processing on the demos other than that supplied by the patchbay.